I had the chance to drive out to Kahuku for work, and really wanted to make the drive worth it. Took mom along since she loves the scenery and loves the food as much as I do. So what did we get a bite of? SHRIMP, of course!! Now, I've done my fair share of research and also my fair share of "sampling" all of the shrimp trucks, so which is my favorite? Well, I can tell you this much- I used to love Giovanni's, "the original shrimp truck," but have since found out that their shrimp isn't fresh!! It's shipped in frozen from Asia. You would think that all of the shrimp trucks would be serving fresh shrimp from the shrimp farms in that area...but not the case! So ever since, I have tried Romy's and Fumi's, which I can guarantee serve fresh shrimpies. Fumi's even has a bus tour that goes out directly to their shrimp farms. I believe you can catch your own and then ask Fumi's to cook it any way you'd like! 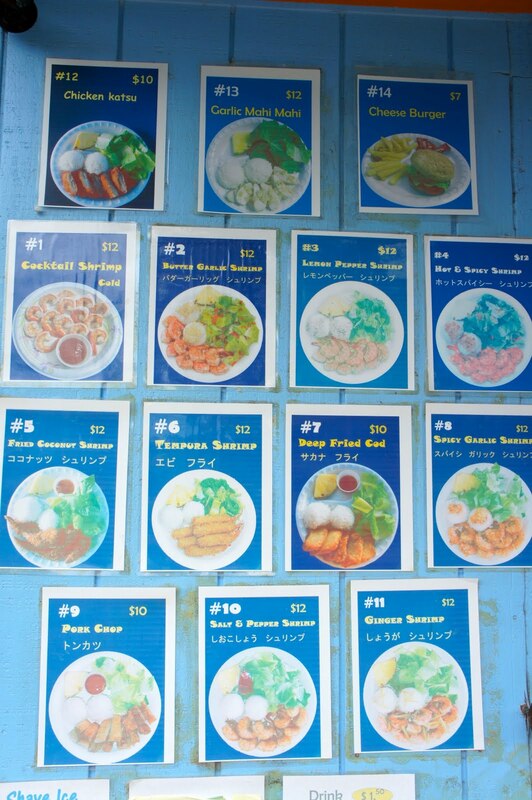 They have a variety of toppings and ways they cook/serve their shrimp- anything from Coconut Shrimp, Ginger Shrimp, Shrimp Tempura, to their most popular, Butter and Garlic Shrimp. From what I've seen, Fumi's has the most variety in their menu from Shrimp and even some fish dishes, such as Cod, Mahi Mahi or even Chicken Katsu. Romy's is also great- I've tried their Butter Garlic Shrimp and really can't tell the difference in taste between there and Fumi's. The only difference between the two is that Romy's offers one pound of MONSTER steamed Prawns. These "buggahs" are HUGE. See a picture from Yelp here. I have yet to try these, but have heard and read they are juicy and sweet! Lots of meat! Will have to get back to you about those prawns at a later date...but for now, enjoy Fumi's and Romy's Shrimp pics! I would recommend either place; just depends what you're in the mood for! Li Hing Pineapple from Romy's! So juicy and sweet. We went around 4pm. That's why it seems not busy at all. Trust me though, this truck gets VERY crowded! Fumi's also offers Shave Ice and Hawaiian Popcorn! If you want some fresh fruit, fresh Papaya is also offered on the menu. Fruit from the North Shore is a must. Shrimp Tempura was so crunchy and light. Not too oily. Butter Garlic Shrimp- comes with a slice of sweet pineapple and side salad with a light dressing as well. A LOT of garlic...and butter! The shrimp were basically swimming in butter and garlic. This dish is not for the faint of heart. located across Fumi's. THIS is the one where you should get the corn. Other stands are mediocre.